The Center heavy weight of the defense line in the Oujo White Knights football team. Otawara isn't the smartest of people making it kind of akward that he is the Team Captain, yet he knows how to motivate his team mates during the matches. Otawara has a large posture and a jolly spirit. He laughs through basically any situation and has hardly ever shown signs of depressed feelings. Other then that he is slightly grotesque, always picking his nose, farting when he's excited and having the habit of forgetting to wear pants. 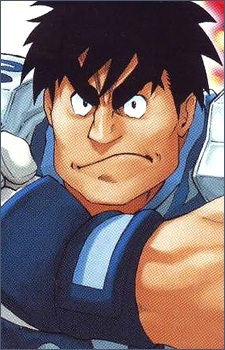 In terms of strength Otawara loses to Kurita. Yet unlike Kurita he also has speed, resulting in that if Otawara has a running start before impact on his opponent, the combined force of his body and speed becomes an immense power.